Sepang, Malaysia: Lewis Hamilton turned the tables on world championship leader Nico Rosberg, giving himself a badly needed boost with the fastest lap in second free practice Friday for the Malaysian Grand Prix. Rosberg has been in dominant form over the past three races, winning them all to turn a 19-point deficit into an eight-point lead in the title race. 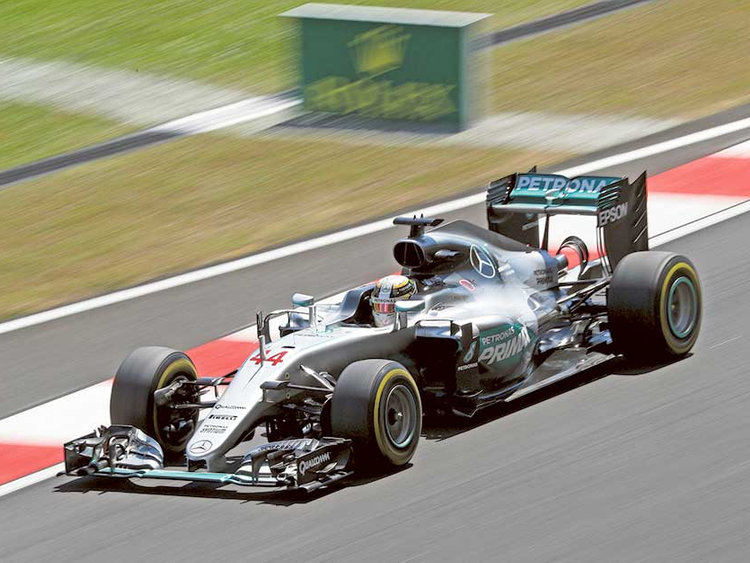 But his Mercedes teammate and the reigning world champion Hamilton lapped the 5.543km of the Sepang circuit in 1min 34.944sec on his soft-tyre qualifying simulation run, 0.244sec quicker than the German. With the sun heating the newly laid track to a blistering 58 degrees Celsius (136 Fahrenheit), Hamilton proved most adept at getting the best from his tyres in the harsh conditions. Hamilton surprisingly also went faster on the hard tyres that must be used for at least one stint during Sunday’s race than Rosberg managed on the supposedly quicker medium compound. After losing more than half of his set-up time to mechanical problems in practice two weeks ago in Singapore, Hamilton would have been delighted to get two almost completely untroubled sessions under his belt on Friday. He managed to clock up 35 largely untroubled laps during the afternoon with Rosberg running for one lap further. Ferrari were the next best in the classification, with last year’s winner Sebastian Vettel third fastest in 1:35.605 followed by Kimi Raikkonen. Late in the session birthday boy Max Verstappen, who turned 19 on Friday, gave himself something to celebrate by pushing up to fifth behind the Ferraris with a lap of 1:36.037. But the other Red Bull of Daniel Ricciardo was relegated to eighth place as the Force India of Sergio Perez and the McLaren of Fernando Alonso went sixth and seventh fastest respectively. Alonso was using an upgraded engine package from Honda, which means he will incur penalties that will drop him to last on the grid in Sunday’s race. He will use his old engine for the race, saving the more powerful new unit for next week’s Japanese Grand Prix at Suzuka, the home race of McLaren’s Honda engine suppliers. Earlier Rosberg had been quickest in morning practice on soft tyres but Hamilton did not manage a clean flying lap on the same set-up and was 0.494sec adrift, though that lap was set on the slower medium compound. The morning session had been brought to a dramatic halt after just 11 minutes when Kevin Magnussen’s Renault burst into flames in the pit lane. Magnussen, who had returned with smoke coming from his engine cover after just one lap, was forced to leap to safety when fire broke out outside the Renault garage. Pit crew were quickly on the scene with extinguishers but the session was delayed for 15 minutes. Renault engineers managed to get the Danish driver back out for the afternoon session after frantic repairs, and he came in 19th fastest.